Keys to the Published Australian Species of Ramaria (Fr.) Bonord. This is the second part of the two part series on the systematics of Ramaria and it contains LINKS to the keys to the taxa listed in part 1. These keys cover only the 19 validily published species of Ramaria currently known to occur in Australia. 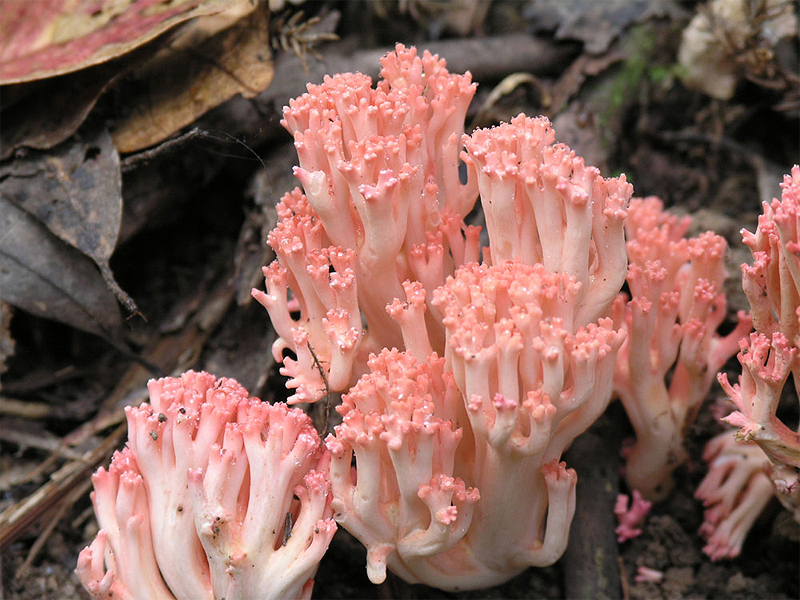 There are many more Australian species of Ramaria than are contained in these keys and it is quite possible that the total number of species of Ramaria found to occur in Australia will be over 100. Some initial work has been done on the species that occur in southern Queensland, central New South Wales, Victoria, Tasmania, South Australia and the south-west of Western Australia, but even so, there are at least another 10 undescribed taxa known to the author and it is his belief that work so far has "only scratched the surface". The entire expanse of tropical northern Australia remains largely unknown as regards species of this genus. The treatment here is "Ramaria sensu lato". This means that if the fruiting body is coralloid and has ochre-yellow to brownish tinted spores which may be warted, striated or spiny, then it is contained in genus Ramaria. There are alternative treatments which place the spiny spored species of Ramaria into the separate genus Phaeoclavulina Brinkmann, however this treatment has been rejected in favour of retaining the traditional simplicity of a single genus in which the coralloid structure is so readily recognised. So far, no known Australian species of Ramaria has smooth, undecorated spores, however at least one such species has been recorded for Europe and is retained in Ramaria because its spores are brown tinted and all other characters conform to those of the genus. Any key to the species of Ramaria deals with a remarkably complex group that can be extremely difficult to separate into individual species. The problem is compounded by the fact that despite the fruiting body being apparently so simple, it can display considerable variation under close inspection. 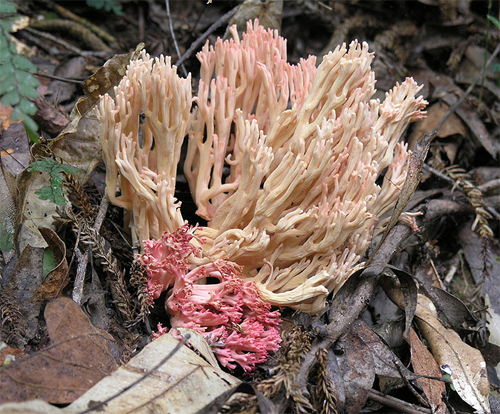 Even more difficulty is created by the fact that in many species, the macrocharacters of the juvenile stages can vary considerably from those of the mature stages: Ramaria botrytoides (Peck) Corner is a classic example of a species in which the mature specimen differs in both colour and physical dimensions and the two stages could easily be mistaken for two different species. Another set of problems emerges when the microcharacters are considered on their own. There are a only a limited number that provide effective species differentiation: spore size and shape; the presence/absence of clamps; the presence/absence of skeletal hyphae or secondarily skeletalised hyphae; and more randomly, the presence/absence of highly refringent (gleoplerous) hyphae. Basidial size and shape is often of minor use because there is frequently little difference from one species to another. Another very unusual problem that emerges is that spore and basidial sizes are not only found to vary with the basidioma maturity, but also can be dependent upon where one takes the spore or basidial sample from an individual basidioma. Erroneous descriptions have been written which have depended upon spore samples taken from a single location on a basidioma where the measurements differed markedly from the normal range. Herbarium material in particular usually suffers from a serious lack of well written field notes. Detailed colour observations are critically important records for species of Ramaria, but additionally, the shapes of the apices, the shapes of the branch axils, the smoothness of the branches, surface grooves dependent from the axils, and the presence or absence of aborted branches or rhizomorphs are all essential characteristics that need to be recorded. Unfortunately, too many of the collections, if they even have field notes, have been taken from quite juvenile material and thus the described characters do not reflect the characteristics of the mature fungus. It is an unfortunate fact that without accurate colour records, many herbarium collections have so few good characteristics for identification that all a researcher can say for certain is that the material is a collection of Ramaria. DNA analysis may offer some hope for the future. Two keys are presented here. The first is what might best be called a "natural key". It uses some macrocharacters, but also depends considerably on the use of microscopic characters to separate the various taxa and should give consistently accurate results. The second key uses colour and readily observable macrocharacters to split the species apart. This second key is not as accurate as the "natural key", but it should allow the user to at least approach a "cluster of similar species". Always keep in mind that the 18 taxa presented here are a very small proportion of the Australian species of Ramaria. Never "force" a species into the key…there is little doubt that new taxa outside the boundaries of these two keys will be collected and that is part of the excitement that presently surrounds this remarkable group of very beautiful fungi. Special Note: Both the keys provided below have not yet been fully tested with field collections requiring identification. The author would be extremely pleased to receive comments and suggestions from users so that the keys can be refined and improved in their accuracy. This key uses some macrocharacters, but also depends considerably on the use of microscopic characters. This key uses colour and readily observable macrocharacters. These keys have been prepared from data contained in an Interim Submission on the taxonomy of the genus Ramaria in Australia, presented to ABRS in 2007. I wish to acknowledge my thanks to ABRS for allowing me to commence the production of documents which release this information to the Australian mycological community and in particular Dr Pat McCarthy of ABRS for his kindness and assistance in "getting the ball rolling". It is hoped that more of this information will shortly become available.